Greeted by a sparkling white vintage ram skull hung unsuspectingly on the grand wooden door of The Warehouse Kitchen, you are instantly intrigued. The yellowing bamboo shoots on either side of the building frame the grey exterior, adding to the dramatic welcome. On entering, however, the white open space and high ceilings are a contrast to the stark exterior. The modern lighting accentuates the bright open, yet Western design. A mix of wooden pallets, wooden beams and metal make up the aesthetics, giving you that warehouse feel. The outdoor space is equally enticing. The upper deck is surrounded by trees, shading you from the harsh sun and offering a mock treehouse dining experience. 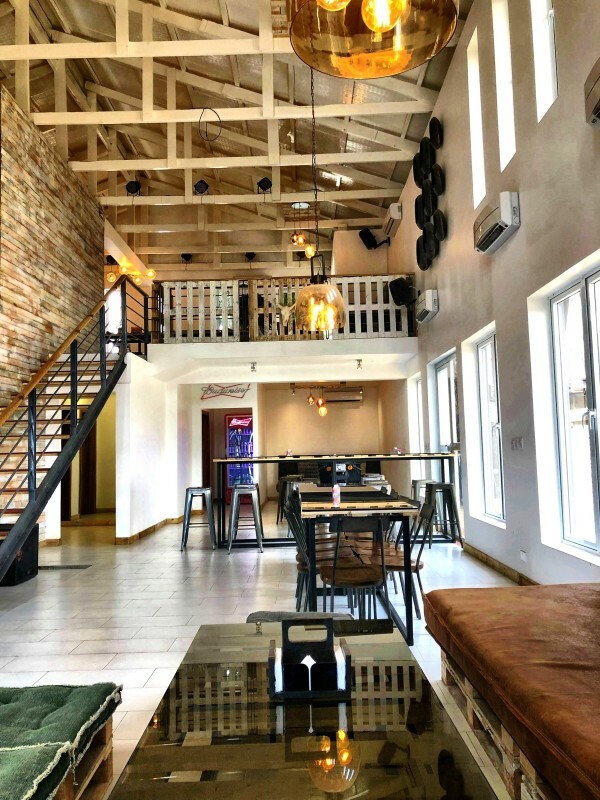 While the graffiti adorned walls overlooking the courtyard, with a big screen and lounge space, are perfect for live shows and watching games. 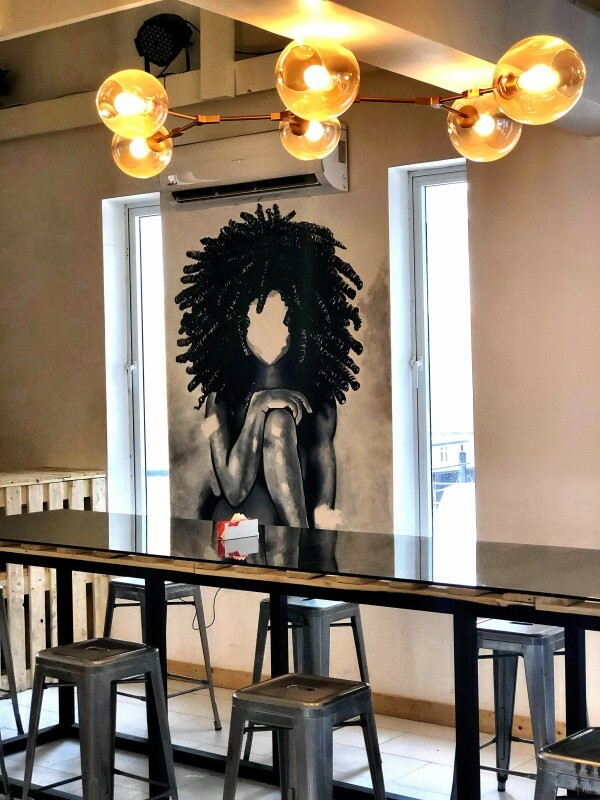 The Warehouse Kitchen echos a modern American Western space, however, the food is primarily Nigerian. 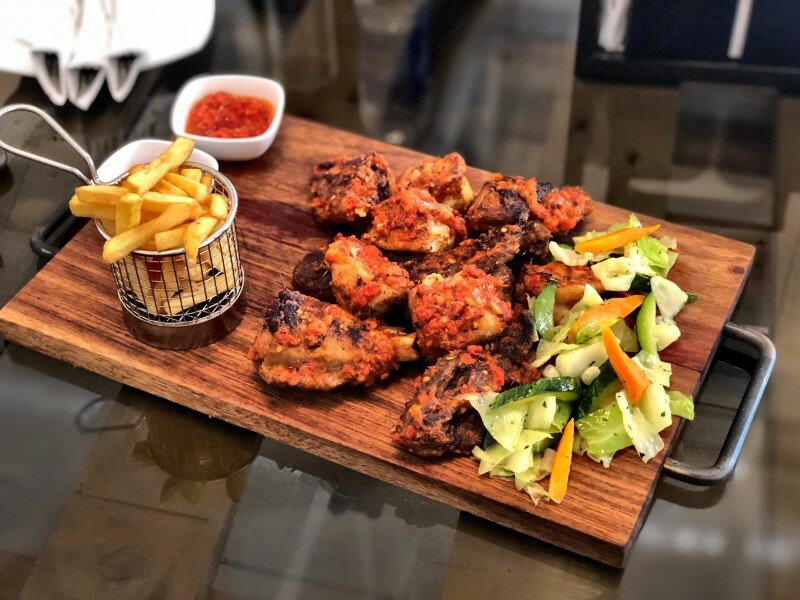 They pay homage to Nigerian delicacies using both local and imported ingredients to create the perfect culinary experience. Their Warehouse Platter is grander than one would expect. 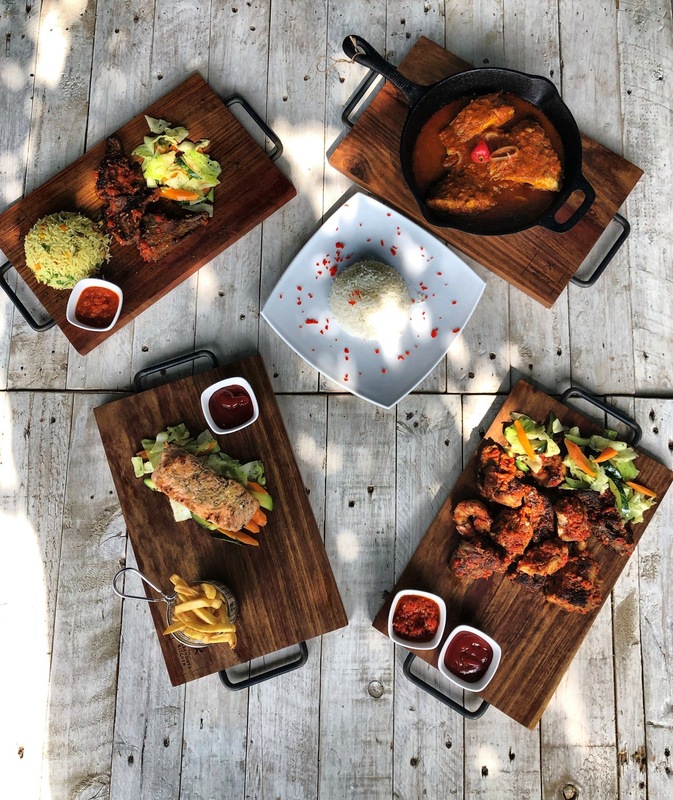 With a generous portion of grilled prawns, lamb chops, succulent turkey and croaker fish, all marinated with garlic and Nigerian spices and served with a side of sauteed vegetables and fries on a large wooden platter, this is the perfect dish for sharing. The spices are not spared in any of their dishes, and the Lamb Chops are no exception. The tender imported lamb is marinated in parsley, ginger, black pepper and a pepper sauce that is cooked to give it a sweetness that you can taste from the first bite. But no dish is grander than the Tilapia Fish Stew. 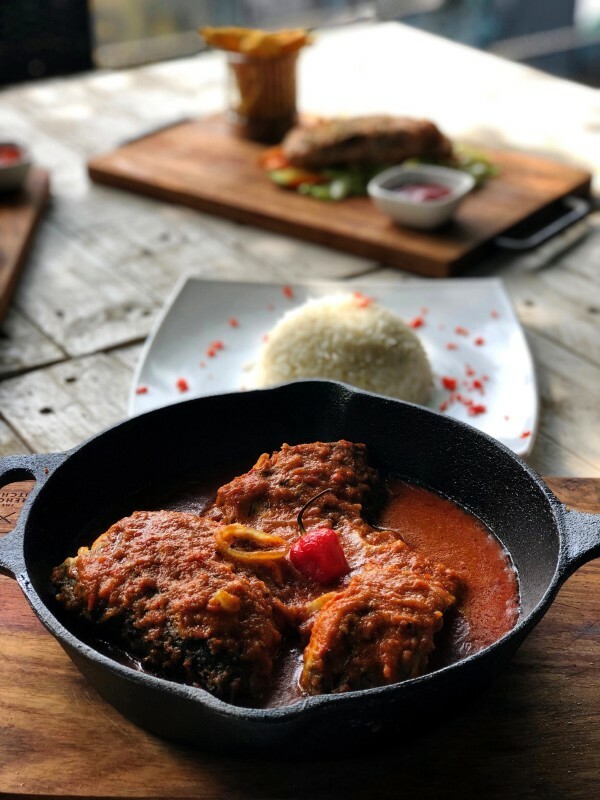 Served in a large sizzling skillet, the large pieces of tilapia fish sit in a pool of fresh tomato stew. The side of white rice is the perfect partner to this opulent dish. If you’re looking for something lavish that is a bit less spicy, the Grilled Salmon is superb. 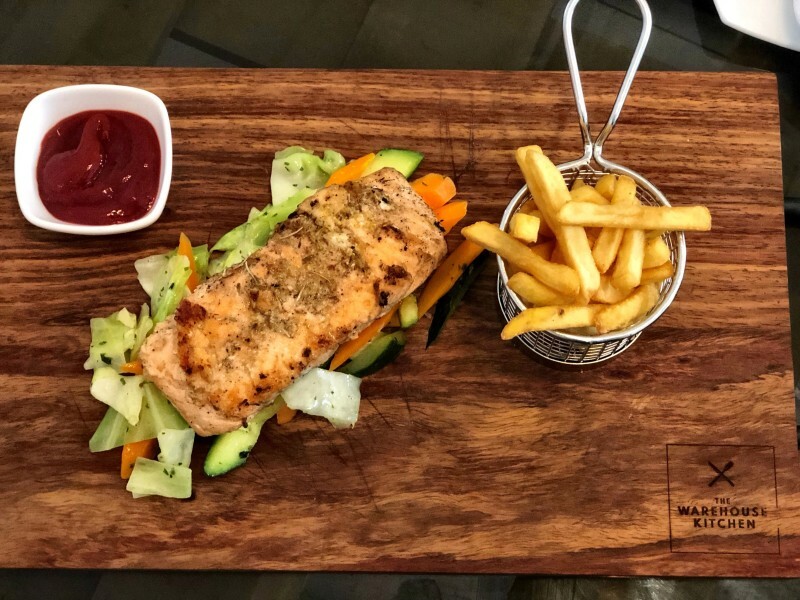 Grilled to your liking on a bed of crisp, sauteed vegetables, the salmon is subtly marinated, keeping the spotlight on the star. A side of fried rice, fries or plain rice is ideal in a supporting role to the salmon. Nothing on the menu is trying too hard to impress; the dishes are simple yet delicious and full of flavour. The cocktails, on the other hand, are made to impress. The upstairs bar pulls out all the stops with their cocktails. 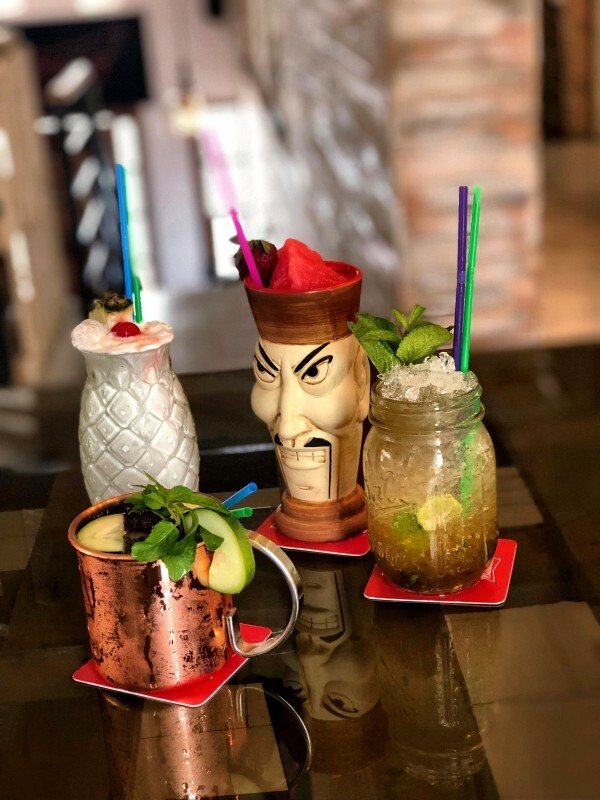 From a super refreshing Mojito in a mason jar and a Moscow Mule served in its traditional copper mug, to a tropical, creamy Pina Colada and a Strawberry Margarita served in a suspiciously angry-looking tiki mug, every cocktail is a showstopper. 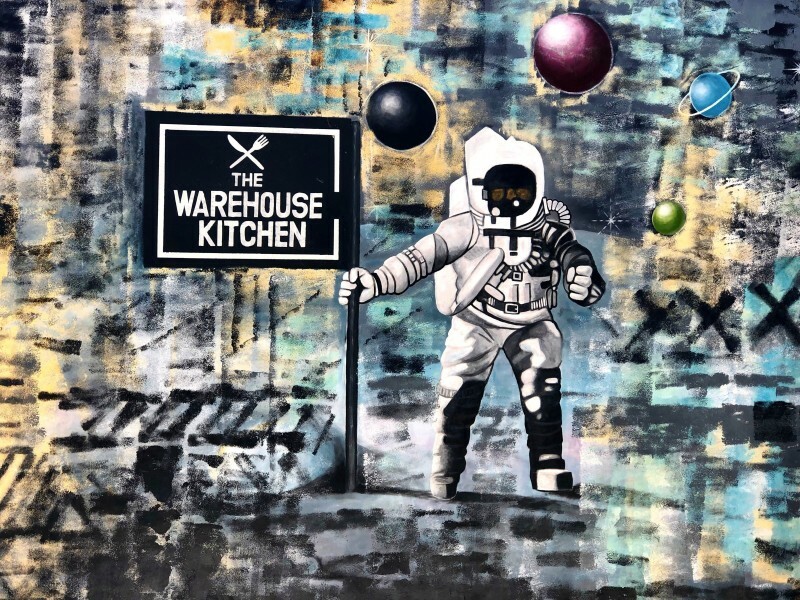 The Warehouse Kitchen is a place for friends to meet to share and create memories. It’s a great place for events and gatherings. It has all the ingredients needed for an unforgettable experience. Having opened over the Christmas holidays, they will continue to evolve and grow with even more offerings on their menu. For now, The Warehouse Kitchen is ready and waiting to host you for any occasion.